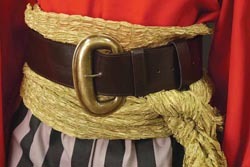 The stately belt harkens back to the days of the adventurous high seas. With a large 5 1/4" antique brass buckle, and a 2 3/4" wide leather belt, this piece looks great when combined with any of our sashes. Measures 56 inches long. Brown only.